Issued by Sony Classical, The Ultimate Star Wars Vinyl Collection is available to pre-order now for its January 8th release. In addition to an 11-disc vinyl collection, a CD collection will also be available for much cheaper. 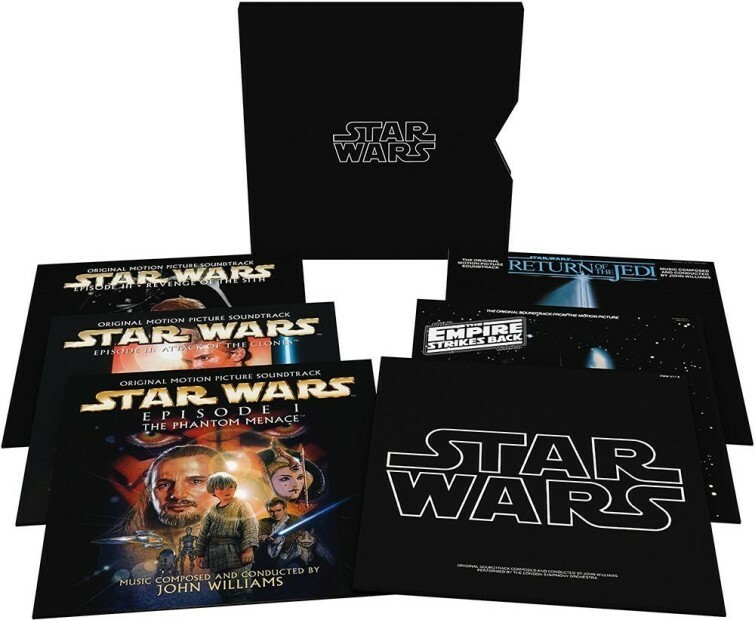 Star Wars: The Ultimate Vinyl Collection includes each of the six film soundtracks from Star Wars Episode I: The Phantom Menace to Star Wars Episode VI: Return of the Jedi in deluxe gatefold sleeves faithfully replicating the original artwork. Audio was transferred from the original LP masters using the highest resolution (up to 192kHz/24bit) and pressed with heavy 180gram vinyl. The six soundtrack set (on 11 LPs) is presented in a black, soft-touch laminated slipcase with an embossed, hot silver foil Star Wars logo and includes a digital download card for one complete box set (all six soundtracks). The vinyl set is available to order here, and the CD set can be ordered here.